Let’s talk water pumps for vehicles here in Denver. The engine in your vehicle is cooled by coolant/antifreeze mixed with water. This mixture circulates around the engine, absorbing some of the heat. The coolant then flows through the radiator where air cools it down for the return trip back through the engine. Your vehicle’s water pump is what drives this process. Cooling system problems are the number one mechanical failure in Denver. So the water pump plays a pretty important role. You can’t get very far without a water pump. After all the distance and years of pumping coolant, water pumps just wear out. 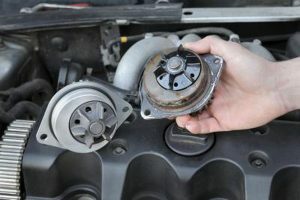 You might notice a whining or grinding sound coming from the water pump, or you might see coolant leaking from the pump itself. The precise location of the water pump varies depending on the vehicle. Some vehicles have the water pump attached to the outside of the engine where you can see it. With these, the water pump is driven by the serpentine belt. Some vehicles have the water pump that is driven by the timing belt. The timing belt cover often hides the water pump when it’s set up this way, so you can’t see the pump without removing the cover. When you have Express Car Care replace the water pump on one of these, you really should replace the timing belt at the same time. We’ve already gotten things taken apart and it’s very likely the belt has been contaminated by coolant. Timing belts usually need to be replaced at similar intervals anyway, so it makes a lot of sense to do both jobs at once. The opposite is true too; when you change the timing belt on this type of engine, replace the water pump while you’re at it. The water pump will eventually fail and getting to it is an expensive project. For not that much more you can take care of both the timing belt and the water pump at the same time. Come in and see us if you think you can use our services for your water pump.